The Dos and Don’ts of Airline Travel | hesaidwhatnow? For everything in life, there is the right way to do things, and the wrong way to do things. This certainly applies to air travel, where these two men recently demonstrated both approaches. By which I mean the right way to be an idiot, and the wrong way to be an idiot. The first is a man who was faced with a dilemma before boarding his flight to Nairobi, Kenya at Guangzhou Baiyun International Airport in China. Upon check-in he was told that his baggage was over the weight limit and he would therefore have to pay a charge. The problem was a relatively common one. His solution definitely was not. Instead of copping the fine, the man emptied his suitcase of its clothing, and put the items on. All of them. As in nine pairs of jeans and over 60 shirts. Over what he was already wearing. Talk about accessorising. Hmmm, it’s a bit chilly. I think I’ll wear…everything! A couple of questions spring to mind. Firstly, how did he manage to fit all the clothes on top of each other? One can safely assume that skinny jeans were not involved. Secondly, how did he move once he had them on, let alone fit through the cabin door and into his seat? Most pertinently, though, did he really need to put on all of his clothes to get under the weight limit? Surely a slightly less ridiculous option would be to put on a lazy 20 or so items and see if that did the trick? Either way, he prevented the airline getting more money out of him, so he should be applauded. This guy, however, should not. I wonder if I could do this at work? The unnamed 46 year old resident of Iceland apparently drank all of his duty free liquor on the plane, resulting in him transforming into the most annoying human being on the planet. He took being loud and abusive to new levels: in between screaming that the plane was going to crash, the man took time out to spit on passengers and try to choke the woman who had the very good fortune of having the seat next to him. 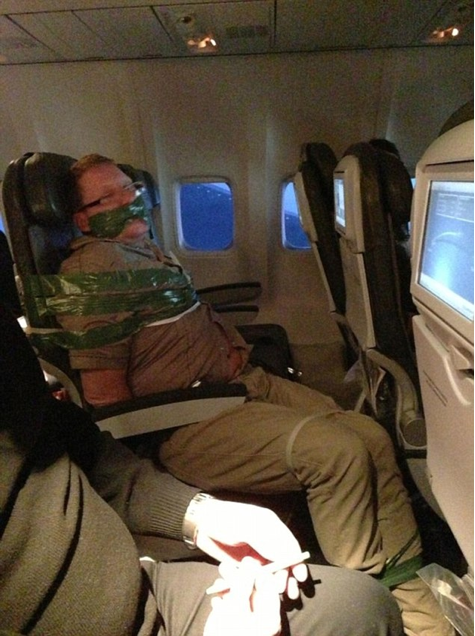 Deciding that being assaulted was probably not the most acceptable on-flight experience, the other passengers took matters into their own hands and tied the man to his seat, wrapping his abusive mouth up for good measure. Although the end result was only slightly less comfortable than a normal airline seat, the DIY project did the trick, proving yet again that duct tape can fix almost any problem. Although it was a good job that the man wasn’t wearing 60 shirts and nine pairs of jeans at the time, otherwise they might not have had enough tape. ← Super Heroes and Mutant Villains – Update!